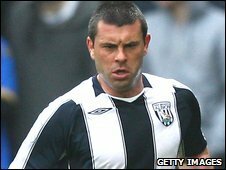 Bolton have signed defender Paul Robinson from West Brom on a season-long loan deal, bringing to an end their long pursuit of the player. The two clubs had been at odds over the fee for the 30-year-old with West Brom demanding double Bolton's £500,000 bid. The clubs have reached a compromise via an initial loan deal with a view to a permanent transfer. Robinson previously worked under Bolton manager Gary Megson during the latter's time in charge at the Hawthorns. Robinson had been with West Brom since 2003 and signed a new two-year deal with the club 12 months ago but the Baggies' relegation from the Premier League last season prompted him to seek a return to top-flight football. Gives us extra options in defence and allows us to use our funds elsewhere. Megson said: "I am delighted that we've managed to get Paul in. He's got a great deal of Premier League experience and is the type of player Wanderers supporters will like. Robinson will link up with his new team-mates in Austria on Sunday. He is Megson's second signing of the summer after Sean Davis completed his free transfer from Portsmouth on 1 July. More arrivals are expected as the Bolton boss looks to strengthen a squad which was the smallest in the Premier League last season.